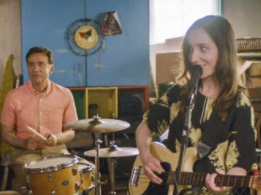 My one-line description of Zoe Lister-Jones’s directorial debut, Band Aid: It is love, loss and so much laughter. Band Aid is like the perfect marriage of Begin Again and Celeste and Jesse Forever. The original songs Zoe Lister-Jones wrote for the film are hilarious and honest. The scenes seem very organic and the film develops nicely. Lister-Jones also frames the shots crisply, providing the audience with a film that isn’t just fun, but beautiful. The acting in Band Aid is really good. The cast does a great job of balancing the humor and the sadness of the film. The range of emotion in the film is seamless and Adam Pally gives one of his best performances yet. Fred Armisen is as brilliant as ever, and the rest of the cast boast a slew of cameos by Lister-Jones’s friends and former co-stars. Band Aid easily gets a 4 of 5 stars rating for its well-written, greatly-acted comedy with heart. The wonderfully-original songs from the film are available on iTunes.